By P. Anyang' Nyong'o Yesterday on Saturday, 29th of September, at his Boya home in Kano, Kisumu County, we buried David Nalo who passed on at the tender age of 55. By the time he passed on David had achieved a lot for himself, his family and the people of Kenya and East Africa. Many who have eulogized him have spoken of his humility, charm, intelligence, commitment to his work and thoroughness in whatever he did. He was a great family man, adored and deeply loved by his family. I want to speak about the David Nalo I knew, the man I worked with as my Permanent Secretary from June 2003 to August 2005 in the NARC government. The man with whom we produced the Economy Recover Strategy for Wealth and Employment Creation (ERS) it's accompanying Investment Program. The man with whom I organized two very successful Investment Conferences for this country at a time when the business community, locally and internationally, needed to be convinced that Kenya had changed and they could invest here and make money. Few people living today know this story intimately, but the following know significant aspects of it because they were part of the team in which Nalo played a central role. These were former Permanent Secretary Harry Mule, Dr. David Ndii and Caleb Opon who first drafted with me the concept paper that provided the foundation of the ERS. It is this paper that was extensively discussed at the Leisure Lodge in Mombasa in February 2003 by the whole NARC leadership and started us on the road to the ERS and eventually to Vision 2030. At that point in time Nalo was still head of the Bureau of Statistics within the Ministry. 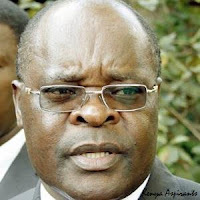 Joseph Kinyua was my PS, and Joe relied a lot on Nalo and very often it was Nalo who led the team of technocrats in the Ministry who critiqued the drafts that my team of advisers presented and engaged in heated arguments that were at times very stormy. Nalo was the one who always calmly brought everyone on course to look at issues cooly and dispassionately. There was then my team of advisers who came on board just about the time Nalo became my PS in June 2003 as Joe Kinyua moved to the Ministry of Agriculture. These were Professor Michael Chege, Sam Mwale and George Outa. The ERS had just been launched and I was wondering how we were to move from there, how the whole government would get down to business and get the economy on the road to recovery and speedy economic growth. This team, working closely with other civil servants like Mukui, Maina, Ogae and many others whose names I cannot now remember became my close family in Treasury Building on Harambee Avenue, and together we often worked even unto midnight serving our Republic. All these people will always remember David, and on their behalf I mourn David. Let it also go on record that the idea of creating a National Economic and Social Council for Kenya came out of a discussion I had with David, Professor Shem Migot-Adhola and Monica Aoko at the Lilian Towers soon after the NARC victory. When I mentioned this to Francis Muthaura as Secretary to the Cabinet we got a strong ally. The NESC has played a key role since then in the reform process. When I went to see David in November last year and found him in agony about a disease he said was an allergy, fear gripped me. David had physically changed and was scratching himself in a way that could not let him sit in peace. But he assured me that doctors were looking after him and soon he would be well. The second time I went he was at the Nairobi Hospital now admitted to be treated for Hodgkin Lymphoma. I was devastated. Cancer again! The memories of what I had gone through made me feel as if the world was caging in on us with so many people I know closely being brought down by this disease. But why David of all people? When he returned to the house and was convalescing, he told me that he was soon to leave for Nebraska for specialized treatment. He left as planned by Dr. Abinya and I breathed a sigh of relief, believing that David would concur this monster. Three weeks later he was back, assuring me that he would need to return to Nebraska, or go to India or South Africa, for a bone marrow transplant. I saw him a few times after that and he assured me the bone marrow program was on. I travelled out of the country and on coming back tried to call David. When I got no answer I assumed that he was already out of the country. I was shocked beyond measure when his dear wife Dorcas called me one evening to inform me David had been admitted to Nairobi Hospital in critical condition. I went to see him. He had gone down. I was convinced he needed to get out of the country and get the bone marrow thing done; his doctors agreed too, but he needed to get a little stronger first to endure the journey. We prayed for this. But David went from bad to worse. I must thank Allan Wamanga of Med Access who worked so hard to arrange for David's possible evacuation to Ruby Hall Clinic in India for bone marrow transplantation. But it was never to be. David finally left us early in the morning of September 13 a few weeks ago to be with the Lord. I have been wondering whether it is the stress of work that we both endured for three solid years that made us vulnerable to cancer. I really don't know. But there it is. Is there anything we could have done to avoid this eventuality? Perhaps yes and perhaps no. Change in life style as they say could have helped. But like William Shakespeare once lamented: "oh vain boast, who can control his fate?" It is really painful to lose such a lovely man, such a productive and dedicated man. 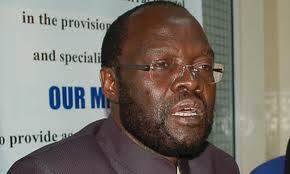 David is the best County Governor Kisumu County will never have! David and I had sat down and planned together how we were again bound to work together to do great things for Kisumu: him as Governor and I as Senator. But it was not to be. Many people will now begin saying let us do this or that in the memory of David. The only people I am sure will do anything meaningful in his memory are his family, particularly his wife Dorcas who has remained steadfast as she endures this painful moment. But one man must surely do something in David's memory without fail. And that man is George Outa with whom David was working on the book on the ERS. Please George let the true story come out. I produced a little bit on it in my book, "A Leap Into the Future" published in 2005. A more robust story must be told by you to remain in the annals of Kenya's history. Then David's soul will indeed rest in eternal peace. David was never one who simply travelled well trodden paths; he always took the challenge to blaze new trails and leave others to follow. That is why the two of us found it so pleasurable to work together, always spurring intellectually and getting delight in what we found was so new and so fresh in terms of ideas. The good that David did will always live after him as we leave him to rest with our ancestors.